This family mansion was Gaudí’s first major project for Eusebi Güell, and the first modern building to be declared a World Cultural Heritage site by UNESCO. Construction began in 1886, when the young architect was given what amounted to a blank cheque by his affluent patron. It was finished in 1888 as an architectural showpiece to coincide with the Universal Exhibition. The area was an odd choice for the period. Money and fashion were moving into the Eixample, but Güell had a fondness for the Raval, which had always been his family home, and he wanted to invest in the rundown and insalubrious district. A secret passage was built to connect this house with the older Güell residences on the Ramblas. For all the effort and expense, the family actually spent little time in this house, preferring their mansion by the Park Güell. During the Civil War, the Palau was taken over for use as a cheka, a Communist Party prison for members of the Trotskyite POUM, which had supported the Anarchists in the battle for Barcelona’s streets in 1937. According to rumour, one prisoner here was Trotsky’s secretary, Andreu Nin, son of Spanish composer Joaquim Nin and brother of Anaïs, who disappeared in Barcelona and was never heard of again. Forty years later, Antonioni used the heavy, brooding, ‘exquisitely incoherent’ atmosphere of the palace as a setting in his film The Passenger (1977). 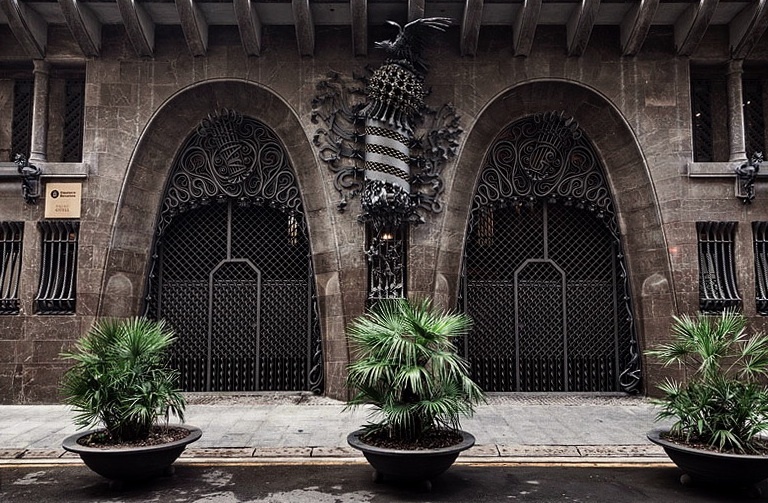 The façade is typical of early Gaudí, heavy and grim though lightened with touches of eccentric detail, like the swirling ironwork incorporating the Catalan coat of arms, splayed across the tympanum of the two main arches. The household’s coaches passed into an interior courtyard vaulted with Gaudí’s signature parabolic arches; the pretty ceramic-tiled ceiling was designed to be easy to clean. The coachmen would then head down the steep ramp to subterranean stables while the Güells and their guests glided up the sombre marble-columned staircase, topped with a patriotic red and yellow stained-glass window. The series of vestibules leading into the central hall are ingeniously designed to allow as much natural light as possible. Columned galleries overhang the street, expanding the interior space, all overhung by ornately carved coffered ceilings. Stained glass depicts Shakespearean characters—a nod to another of Güell’s passions. The visitors’ gallery has a particularly elaborate ceiling; among the dense, Moorish designs are secret spyholes which enabled the Güells surreptitiously to overhear their guests’ conversations. A delicately decorated ladies’ powder room is off to one side. At the heart of the house is the lofty salon, overlooked by galleries and culminating in a magical three-storey-high parabolic cupola, a honeycombed beehive pierced with silvery shafts representing a constellation topped by the moon; this was Güell’s symbolic dome of Montsalvat, the castle where the Grail was kept in Wagner’s Parsifal. The salon has perfect acoustics and was used for concerts, dances and gatherings. The wide upper stairway formed a convenient musicians’ gallery, while the incongruous dour paintings of martyrs and saints wrapped around the corners attest both to Güell’s morose piety and his complete lack of interest in painting – traits he shared with Gaudí. The richest materials were reserved for the family chapel: 16ft panels of rare hardwoods and ivory sheathed in white tortoiseshell fold back to reveal an alcove which once held a sculpted altarpiece of tortoiseshell and wood (destroyed during the Civil War), and a small organ with a red marble panel to protect the ladies’ modesty and hide their legs. Many of the furnishings survived the war (by being moved elsewhere), including a huge Japanese-style fireplace, guarded by scaly wooden serpents, and the enormous dining table, recently purchased from Güell’s heirs, with sumptuous leather embossed chairs. The upper floors contain the family’s apartments – you can visit the bedrooms and the tiled bathroom. Gaudí designed some of the most remarkable roofs in the history of architecture; few people (mostly the family servants hanging out clothes to dry) would ever see them, but God would, and Gaudí built for God. Here, for the first time, he was able to let his imagination and invention run wild to create a forest of 20 chimney sculptures, each organic and different and covered in trencadis. 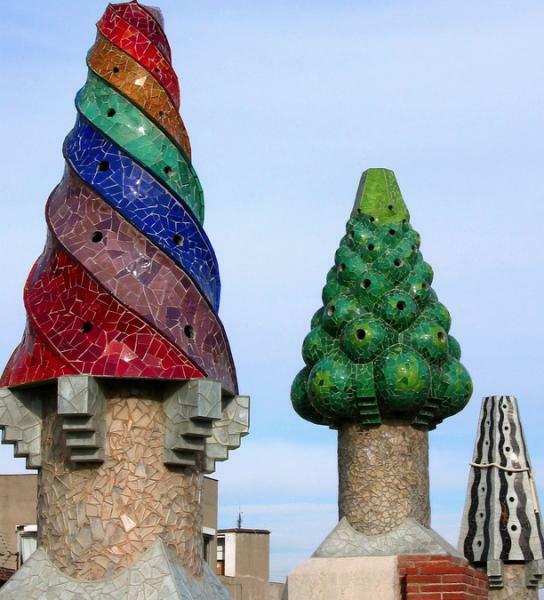 Eight were so damaged by 1988 that they had to be rebuilt by modern artists in the Gaudí style. 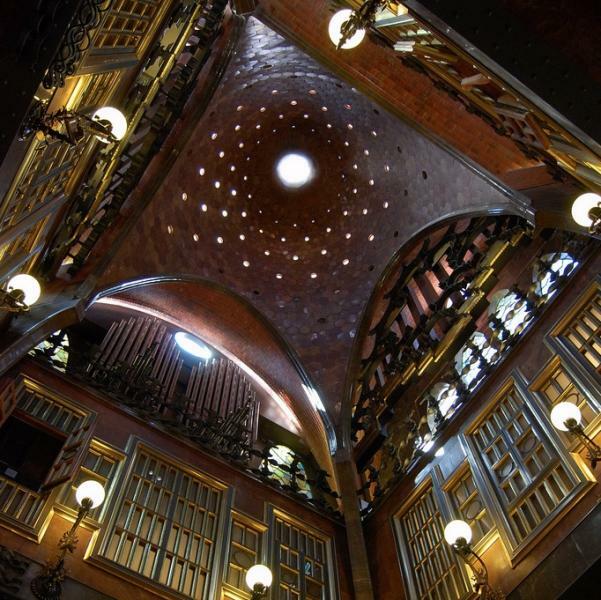 In the centre, the beehive dome of the salon is contained in a spire with a row of parabolic windows, topped by a lightning rod and an enduring Barcelona symbol, a bat. Hours Apr-Oct 10am-8pm (last adm 7pm); Oct-Mar 10am-5.30pm (last adm 4.30pm). Closed Mon except for holidays. Adm €12, €8 students and EU citizens over 65; €5 ages 10-17; under 10 free. Tickets available online; audio guide included in price. Limited free tickets distributed to first comers on Sundays from 4.45pm in summer, from 2.15pm in winter.